The downtown location being a long standing super busy favorite amongst the locals for brunch and brekkie, we were all excited when the a new location opened up in the Garneau / University campus area. After waiting a few months for management to work out growing pains, we headed down for some homestyle fare. The new spot has free parking in the back (just make sure you register your car when you come in so you don't get a visit by a parking ticket nazi), is open, spacious and has lots of sunlight streaming in. A small display case of in house made desserts greets customers at the door, just like the original location. Service is friendly, though they need to hire more staff as there was only one waitress for the 20 tables available, and we suspect the kitchen was short staffed as well, since food took over half and hour to come out.. and we started timing after we got our drinks about 20minutes in. Serving a decent selection of locally sourced, organic colas, lemonade and microbrewery beers, along with a small selection of wine, we pick a few of the more fun sounding ones - a "yuppie" organic, GMO-free beer made with spring water, barley, hops and yeast; a "Curious" cola, a lemon-tea beer and one of my new favs - Crabbie's Ginger beer. Sadly, they had some issues with suppliers, all the ones we wanted were out of stock and we went with the Steam Whistle beer instead. 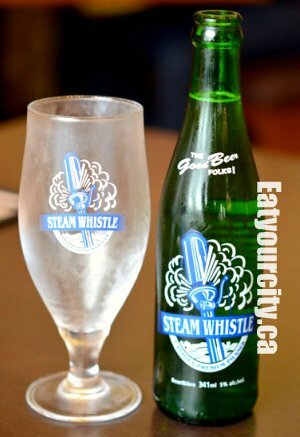 The Steam Whistle beer is as advertised, a fairly clean, smooth and crisp pale beer with a light hit of hops to round out the palate. Served in a cold frosted glass was a nice touch - We had our reservations at first as its made with only four ingredients - all natural organic ingredients, but its a surprisingly good light beer. Sipping and chatting, we browsed thru the menu and waited for our food. Mainly homestyle home-y foods are found on the Urban Diner menu. Some brunch items from the breakfast menu show up in the dinner menu, with a few more sides and larger portion sizes than you would get at brekkie. We go for their tried and true sandwiches, soups, pasta and an entree to compare to the original restaurant. Paired with choice of soup, salad or fries, I went with the daily soup - butternut squash. A good balance of savory and sweet, the rich golden pumpkin colored soup was a little on the thin side and a bit gritty as the soup needed a bit more time in the blender and a touch more cream. Still, it was a nice soup, and the sprinkle of parseley garnish nicely contrasted against the orangey soup backdrop. The Reuben was fabulous. 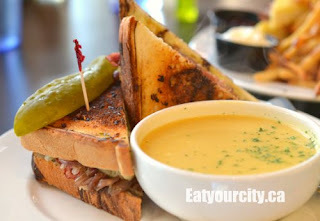 Served with Urban Diner's in house baked swirled rye bread grilled to a crunchy crisp, the corned beef was warm, salty savory and lusciously moistened by the sweet caramelized onions, a small handful of tangy sauerkraut, with the melted Swiss cheese and cumin curry Dijon mustard melding every bite into a world of yum. Oh, and it came with the customary crisp pickle slice. Nom! 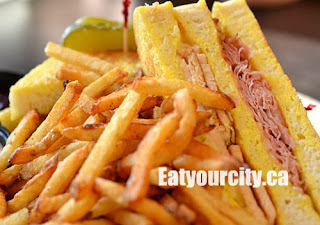 What can get better than a turkey, ham and Swiss cheese sandwich? When you make the sandwich with french toast! The bread is dipped in a light egg wash (rather than the entire sandwich), cooked to a golden crisp, stuffed with a thick layer of shaved turkey and ham, topped with Swiss cheese and served with sour cream and strawberry jam for dunking. Salty, savory and melty cheesey all in one. My girlfriend paired it with crispy fries to make it an American classic meal and pronounced the meal "its good!". My boyfriend craving the super tomato-y meatloaf the downtown location serves at brekkie, ordered the dinner version. 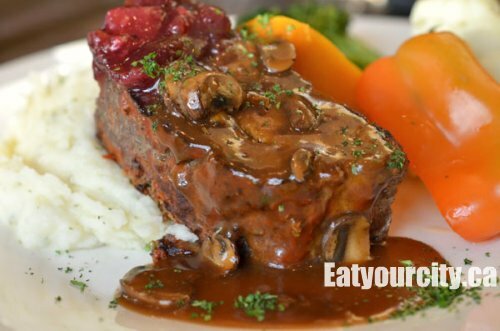 Strangely, despite having the same name as the downtown location, the recipe for this meatloaf isn't the same as the downtown one (or they have a different recipe for brunch vs dinner meatloaf). The dinner version was doused liberally in a beef gravy (yum!) and some tangy cranberry chutney which was much required as the meatloaf was quite overcooked and nearly powery dry in some spots. Definitely heading back to the downtown location for their brunch meatloaf which is night and day to the one my boyfriend tried to finish. The mashed potatoes were fluffy and lightly seasoned. The huge portion of vegetables was nice - momma always said to finish your vegetables! 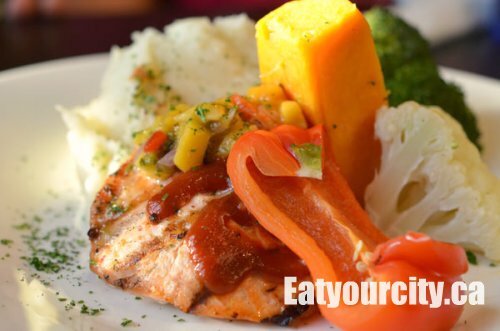 This was a healthy portion of salmon, with a huge scoop of mashed lightly seasoned potatoes, and steamed vegetables (broccoli, squash, red pepper and cauliflower) with a small scoop of mango salsa on top of the salmon. The salmon can be best described by my fellow foodie as unseasoned and a bit bland, though not over or undercooked. The mango salsa added in a bright flavorful note and tasty, though my fellow foodie mourned that there wasn't more of the mango salsa to add a punch of flavor to every bite of salmon. Now everyone has in their mind what the perfect mac and cheese is - people link their mac and cheese with a fond memory and experiences - so the prefect mac and cheese might be one that's smothered in cheese and baked to an ooey gooey perfection, or one swimming in a rich béchamel sauce, or one with bacon or hotdogs or brocolli added in or one that comes in a blue and yellow box that all students are familiar with... to each, their own! Urban Diner's version has fun cavatappi noodles (think long spirally macaroni) to pick up the cheese sauce that is on the bland and runny side. 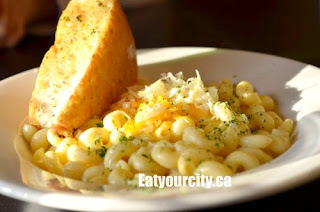 Urban Diner's mac and cheese is a simple version - and my fellow foodie commented it was comparable more to Kraft Dinner than wholesome diner fare. Its topped with a handful of sharp cheddar cheese, and a uber large wedge of fresh garlic toast. 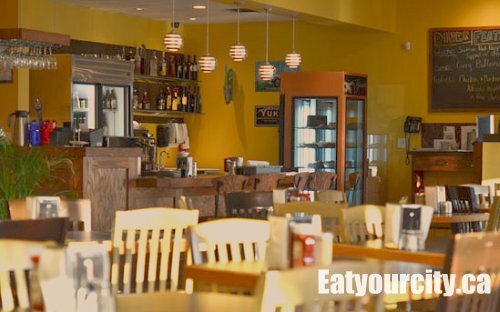 Overall, despite the long wait times for food, its a good place to bring the family along (there was some tables with happy squealing kids), and enjoy some decent hot sandwiches and homey fare. I think I'll still stick to the original downtown location despite the lack of parking and the crowds... my boyfriend likes their meatloaf better, and I've always been hitting up the downtown Urban Diner for tasty brunches... but if you prefer free parking and don't mind waiting a bit for your food, head on down to Urban Diner for some mean sandwiches.